Radiohead has released the video of 'Man Of War', another one of their unreleased tracks which is going to be included in the deluxe reissue of their 1977 album OK Computer. Apart from 'Man of War' the two other tracks being released are 'Lift' and 'I Promise', the video for which was released two weeks ago on YouTube. 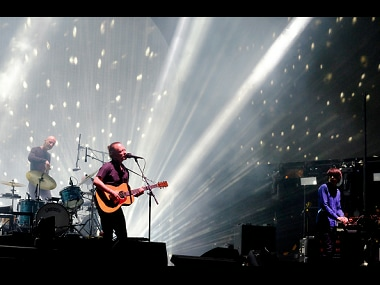 Radiohead at Coachella 2017. Image from Getty Images. The new re-issue album is called OKNOTOK, which marks the 20th anniversary of the English rock band. The songs are important as they hint at what the band could have been, had it released the songs that never made it to its listeners. The video of 'Man of War' shows a confused, scruffy man sitting on a bench in the park and then running aimlessly in the streets. The man seems to think he is being followed by some unseen force, which explains the anxious, disillusioned expression on his face. The video starts to unsettle you, as eventually, the man actually starts being followed by a big group of people. Dodging trucks, taking rough turns and finding his way through thick bushes, the man runs for life. He thinks he has escaped only to find himself tripping over the railway tracks. The group of followers catch up, and the man, horrified, has no option but to surrender. He becomes one of them — as if admitting his defeat. The original OK Computer album had won the Grammy for best alternative music album. The new issue will have the original songs along with the three unreleased songs.